Will someone please let me know how it’s already August? After a slow first few weeks of settling into the camp routine (see my last post for more on that), the past four-ish weeks have sped by faster than I ever thought they could. I said goodbye to my first session campers on the 22nd (and if any of them are reading this, hello!) and had a little over 24 hours to move cabins, craft like crazy, and get to know my new co-counselors before a brand new group of 9 kids arrived the next day. As I mentioned in my last post, my first several days here were some of the hardest I’ve had in this place I’ve known for almost 9 summers now; the transition from counselor-in-training to actual counselor was so different–and so much harder–than I thought it would be, and the strange unfamiliarity that came with my new role was startling to me in its ability to take a place I thought I knew so well and turn it and everything I thought about it on its head. For the first time in my life, I’ve had to fend not only for myself but for the 9 campers who are looking to me to answer their questions, know the plan, and be a role model. And while this was and still is a bit scary to me, it’s also the reason I came back this summer, the reason I applied for this job so eagerly. Right now I’m sitting in my cozy room during a free activity period. I can see the lake peeking through the trees out my window, and the only sounds I hear are the birds and the campers; both seem to be laughing. I am exhausted, but in the good way. In the way that comes only from hours spent laughing with campers over everything from our pet tarp (don’t even ask) to a vetoed plan to put chickens in a counselor’s room; from all of the .3 mile walks to the dining hall and back (yes, I mapped it! ); from late nights spent eating stale pretzel goldfish and sipping my fourth cup of tea of the day while catching up with friends. I am so happy to be right here, right now. All those wonderful things being said, I do miss some things. I miss my family, I miss my room, and I miss my friends. Which brings me to this post (finally, I know)–today is my best best friend’s birthday (her name is Paulina), and I would give anything to be able to spend it with her. 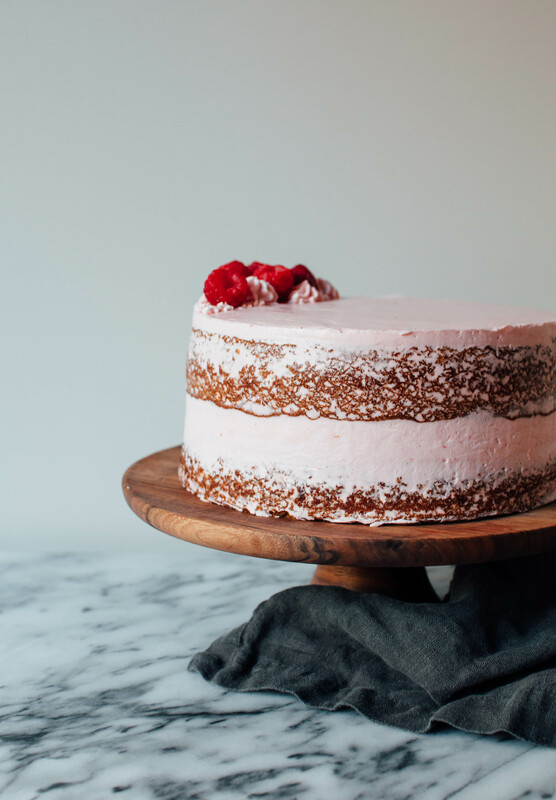 I knew going into this summer that it would be impossible for me to celebrate her day with her, which is why I hatched a plan to surprise her with a virtual cake, custom made just for her. I know Paulina and her dessert preferences like the back of my hand: she hates chocolate (don’t even get me started), but she loves strawberries and raspberries and frosting. 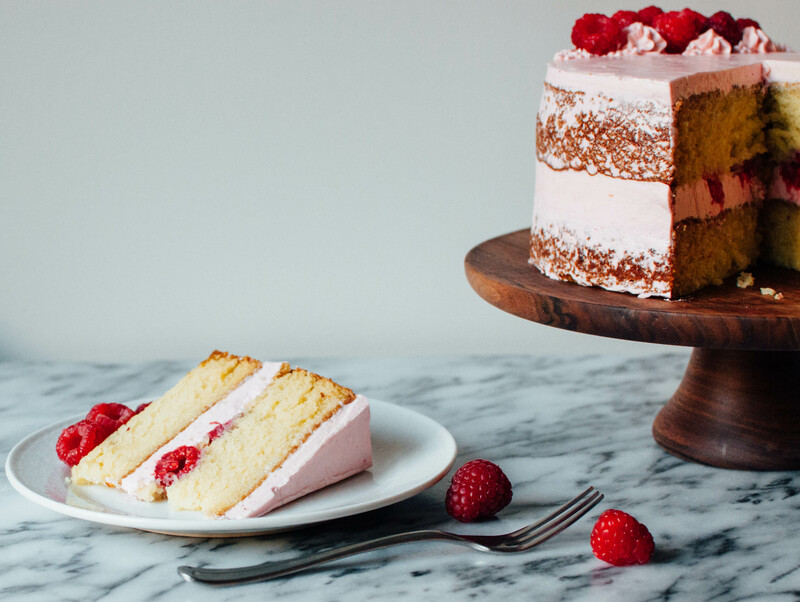 This cake is Paulina in dessert form: fresh and sweet and vibrant, loved by everyone. This one’s for you, Paulina–I love you! Preheat the oven to 350 F. Grease two 8-inch cake pans and line the bottoms with parchment. In a large bowl, combine the sugar, flour, salt, baking powder, and baking soda. In a separate bowl, whisk together the eggs, buttermilk, vanilla, and oil. Add the wet ingredients to the dry and stir until combined. Stir in the boiling water. Divide the batter evenly between the pans and bake until a toothpick comes out clean, around 28-34 minutes. Cool for 10 minutes, then turn the cakes out of their pans and on to a wire rack to cool completely. Puree the raspberries, then strain the mixture through a mesh sieve to remove any seeds. In the bowl of a stand mixer, whisk together the sugar and egg whites. Place the bowl over a put of simmering water, making sure that the bottom of the bowl does not touch the water. Heat the mixture, whisking often, until the sugar has dissolved and the egg whites are hot to the touch. Remove the bowl from the double boiler and whip the egg whites on high speed using the whisk attachment until they have formed stiff, glossy white peaks and have cooled to room temperature, 7 to 10 minutes. Switch to the paddle attachment and turn the mixer to medium low. Add the butter piece by piece. If the mixture appears to have “broken”, just turn the speed up until it comes back together. Once you’ve incorporated all of the butter, slowly stream in the raspberry puree and mix to combine. Turn the cakes out of their pans and trim the tops so that they are flat and even. 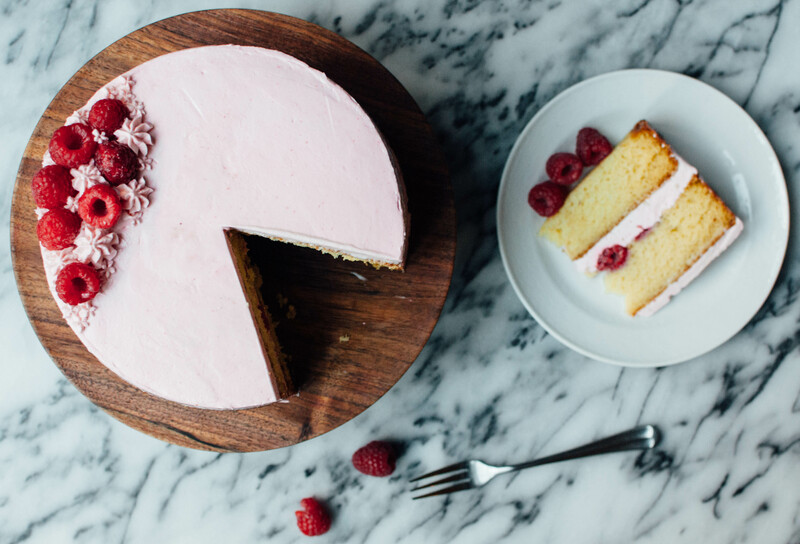 Place one layer on a cake turntable and spread on a good layer of the buttercream. Sprinkle on a few extra raspberries. Place the second cake layer on top flat-side up, so that the top of the cake is nice and even. 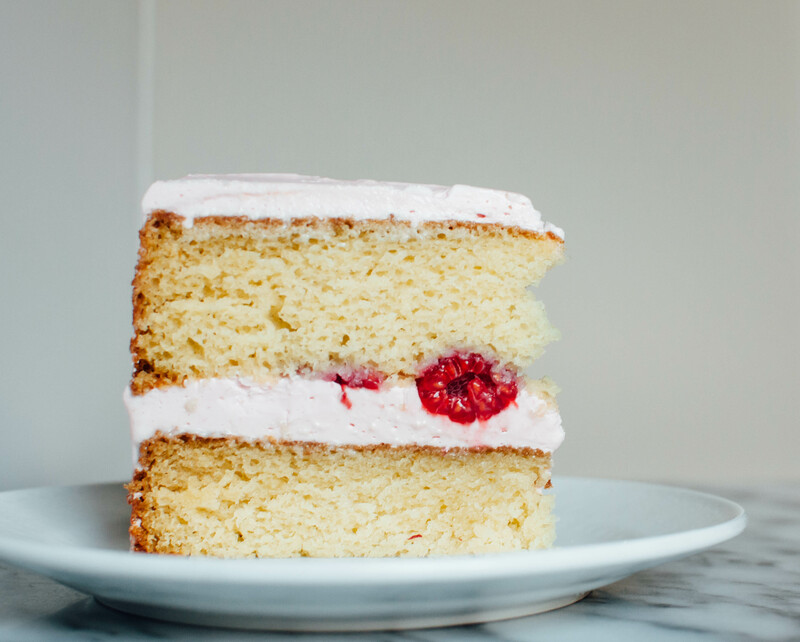 Patch any uneven sides with some of the remaining buttercream, then, using an offset spatula, coat it with a very thin layer of buttercream. 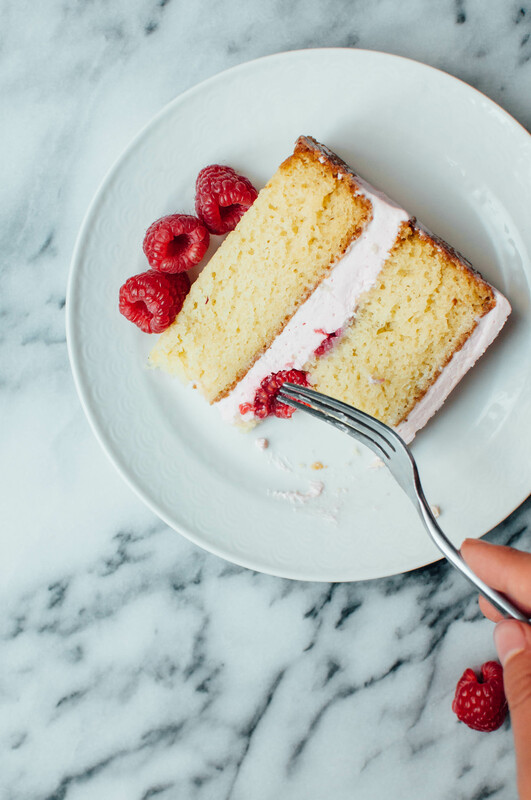 If you’re planning to completely frost the sides, chill the cake until firm, about 15 minutes, then continue with another coat of frosting. 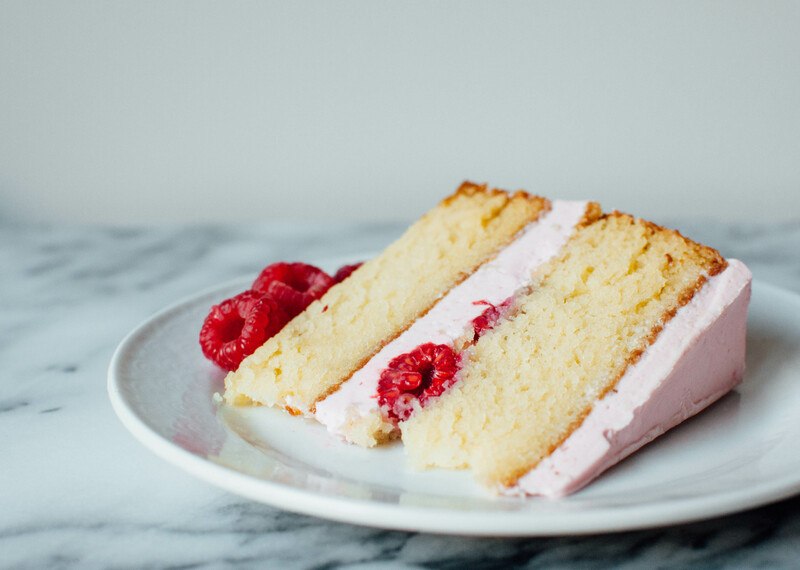 If you’d like to leave the cake “naked” as I did, garnish with some extra frosting and raspberries and enjoy! I bet Paulina loved her virtual cake! Its gorgeous. So summery and fresh. I love the little surprise raspberry in the middle layer. Delicious and delightful! What an absolutely gorgeous cake and even more gorgeous post!! I feel like I was sitting there with you in that cabin!